Congratulations are in order to our first successful Silver DofE exped group, who completed their three day tour round the Cairngorms on Tuesday afternoon. The 5 man team had to cope with a last minute route change due to the bad weather, as their original route involved a river crossing which could have been dangerous after the weekend’s heavy rain. The team set off through Rothiemurchus on Sunday morning, and made their way up and into the historic Lairig Ghru pass. From there, they made their way down Glen Dee and across the Glen Tilt watershed towards Glen Feshie. Despite the altered route, the lads still had to get wet feet at one very full burn, which resulted in the sock-wringing session seen above; at least everyone went home with clean feet! 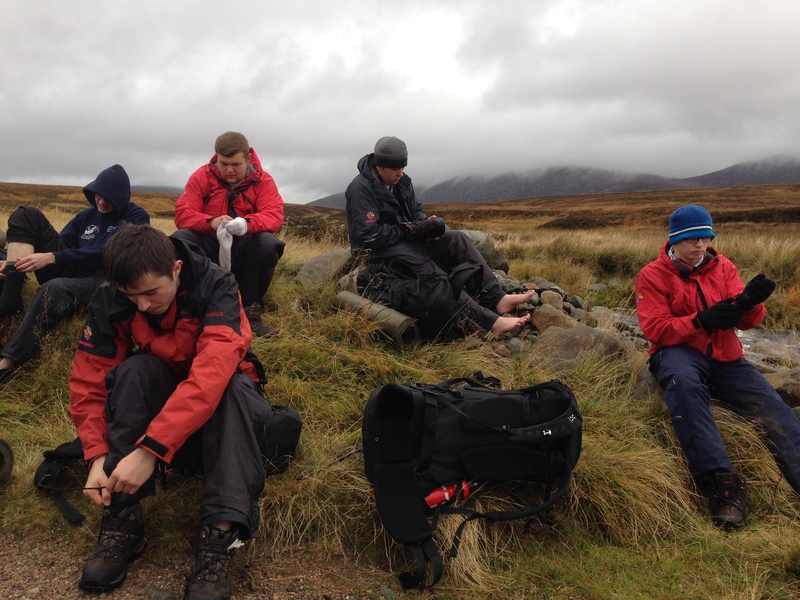 At the end of the three days, the DofE assessor gave them really positive feedback, noting that they’d chosen a really ambitious route which would have been more than suitable for a Gold level expedition. He also commented on the way that they’d supported and encouraged each other, especially on the last day when people started to feel the pace (not to mention the weight of their rucksacks). We’ll be celebrating their success on Thursday night if you want to come along – and we’ll be running several more expeditions next spring if you fancy taking part!